The quality management system standard ISO 9001 was revised and updated in 2015. There are some significant changes that you need to be aware of. A lot has been spoken about these changes on social media. Now is the time to hear from a leading expert on what these changes will mean for your business. This webinar is ideal for those companies that already have ISO 9001 and for those wanting to achieve certification in the near future. 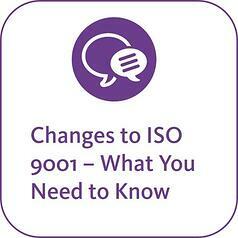 Watch this 1-hour video to find out how you can prepare for the changes to ISO 9001.